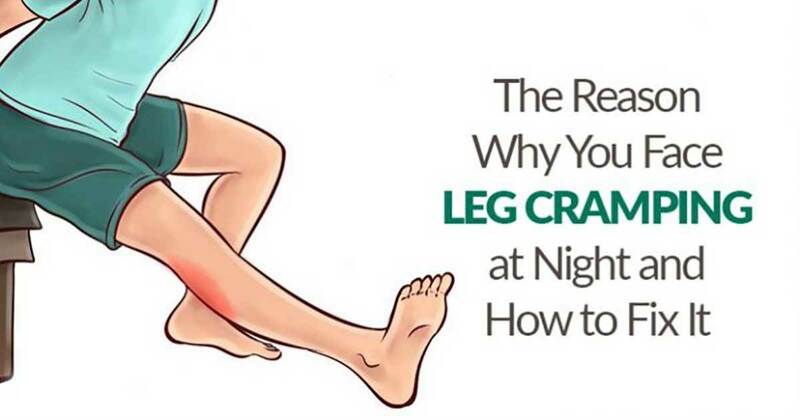 Do you know what nocturnal leg cramps are? It is actually a painful condition which usually occurs when you sleep, and it can wake you up. This condition manifests with involuntary contractions in the thigh and calf muscles. It can last from a couple of seconds to a couple of minutes. As we already mentioned it occurs overnight, and it can be caused due to many factors. These cramps are common in adults who are over 50 years old. However, they might also occur in children and younger adults. Both women and man can be equally affected. A lot of people confuse this condition with the restless leg syndrome, but both conditions are different. The restless leg syndromes allow movement on the legs, on the other hand, the crams prevent all types of movements. What Leads to Nocturnal Leg Cramps? Also, these cramps have been linked to some medical drugs and conditions such as alcoholism, pregnancy, electrolyte imbalances, dehydration, flat feet, beta agonists, diuretics, statins. Epsom Salt is a salt which is rich in different minerals such as magnesium. Having Epsom salt bath on a regular basis can prevent the cramps from occurring in the first place since your muscles will get the much-needed magnesium. The acupuncture is very beneficial since it can lower the risk of nocturnal leg cramps and help relax the muscles. Prevention is the key. Instead of having to deal with these cramps, you can simply do your best to prevent them. According to experts, you should increase the intake of magnesium. You can do that through dietary sources or supplements. You should know that the magnesium is important for the contraction of the muscles. Moreover, it has a significant role in different body functions. In order to get enough magnesium, you can eat more dry fruit, bananas, nuts, seeds, and avocados. In addition, you can try to rub magnesium oil on your thigh and calves muscles, this might help you. You can make your magnesium oil. In a ½ cup of water, you need to boil ½ cup of magnesium flakes. After strain, the oil and then use it warm. It is vital to be physically active, in that way you can prevent the nocturnal leg cramps. Those who are not a fan of the gym should not make excuses. You can try to walk more. Walking is simple but very efficient. In case you wake up due to a painful cramp, what you should do is stretch the muscle. A simple stretch can make the cramp go away. The key to preventing and treating nocturnal leg cramps is staying hydrated. If you consume sufficient amounts of water on a daily basis, you won’t have to deal with these unpleasant cramps. When the cramping occurs, you need to stretch the muscle in order to relieve the cramps. Sit on the floor, extend the legs in front of you and begin flexing your feet. Sleep in loose pajamas, since tight clothes might contract the muscles overnight. These tips are simple but incredibly beneficial. How do you deal with these cramps?